Dog Ear Publishing releases “Firefly: A Skyraider’s Story About America’s Secret War Over Laos” by Richard Diller. Not much is known about the Skyraiders who served in the conflict in Southeast Asia. In this new memoir, a former air force pilot shares his experiences of flying hundreds of night missions over Laos. Laos became involved in the war through internal battles and by providing a vital route structure, known as the Ho Chi Minh Trail, for supplies intended for the North Vietnamese Army in South Vietnam. A-1 Skyraider pilots—like the author—flew propeller-driven airplanes which could stay over a target or survivor for an extended time, carry a wide variety of ordnance and absorb a lot of hits. The brave pilots faced guns and mountains in northern Laos and ground fire in southern Laos. 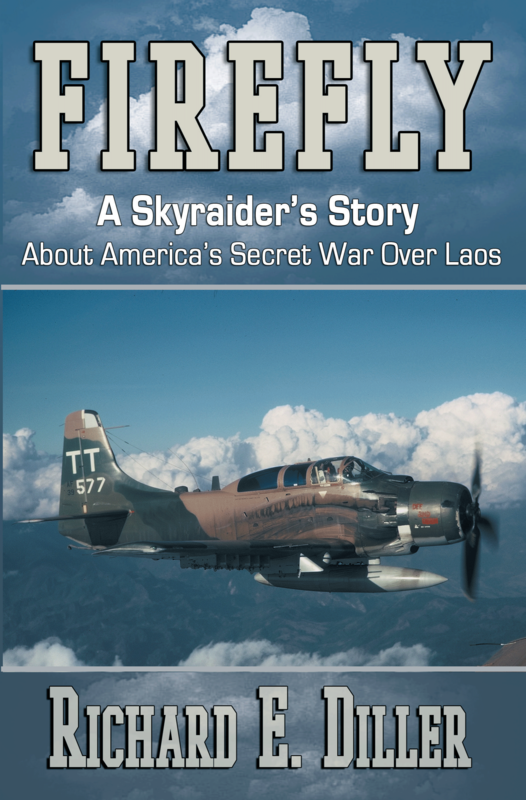 In Firefly: A Skyraider’s Story About America’s Secret War Over Laos, Richard Diller describes missions and how they affected him in exacting detail, drawing on flight logs and audiotapes he sent to his parents, sometimes recorded minutes after returning from a mission. The book also shares details of life on the base—Diller spent a year based at Nakhon Phanom Royal Thai Air Force Base, Thailand, about 300 miles northeast of Bangkok—and the feelings combat pilots deal with every day. This comprehensive insider’s look at an air force pilot’s life ranges from the frustration of endless testing to near-misses during training runs to heart-pounding night missions featuring impossible-to-find targets. Photos put faces to names, and readers will feel like they’re right in the cockpit with Diller as he flies mission after mission. Author Richard Diller received an officer’s commission in the U.S. Air Force through ROTC at the University of Oklahoma. He went through pilot training at Laughlin Air Force Base, Texas, and flew more than 200 missions over Laos. Diller flew for 29 years for Delta Air Lines, serving as a line check airman and captain representative to the Air Line Pilots Association for Chicago-based Delta pilots. Diller, who grew up in Princeton, Illinois, is married and has three children and five grandchildren. For additional information, please visitwww.fireflythebook.com. Available at Ingram, Amazon.com, Barnes & Noble and fine bookstores everywhere. Dog Ear Publishing offers completely customized self-publishing services for independent authors. We provide cost-effective, fast, and highly profitable services to publish and distribute independently published books. Our book publishing and distribution services reach worldwide. Dog Ear authors retain all rights and complete creative control throughout the entire self-publishing process. Self-publishing services are available globally at dogearpublishing.net and from our offices in Indianapolis. Dog Ear Publishing – self-publishing that actually makes sense.